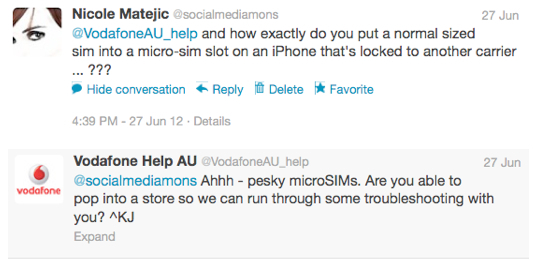 I had the misfortune of being a Vodafone customer back in 2010. I couldn’t call people, they couldn’t call me and my data pack was unusable. A call to Vodafone’s help desk involved about 2 hours on hold only to get through to someone who didn’t understand my English, nor I theirs. After some months of frustration and no help from Vodafone, I got in touch with the Telecommunications Ombudsman who assisted me in having my contract nuked. I swore, I’d never go back. But like a teenager with a crush, go back I did. So it’s no surprise to me that I’m back in the same predicament. Only this time I have the joy of being the sucker with a mobile broadband device that picks and chooses which web-sites I can use. That’s right, the device (a Pocket Wifi) blocks sites like Pinterest, internet banking and even Mamamia! It continuously reloads Hootsuite and has massive issues working its way around Twitter lists. And the kicker is, I get to pay for these services: or lack thereof. 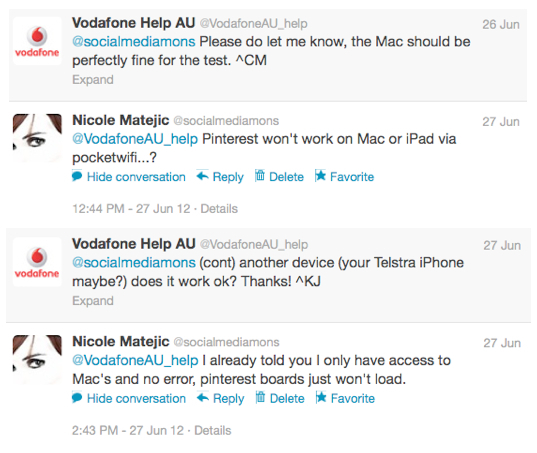 This time I sent off a Tweet to Vodafone’s Twitter account @VodafoneAU_help which you might imagine is helpful given the word ‘help’ in the handle; they’re not. 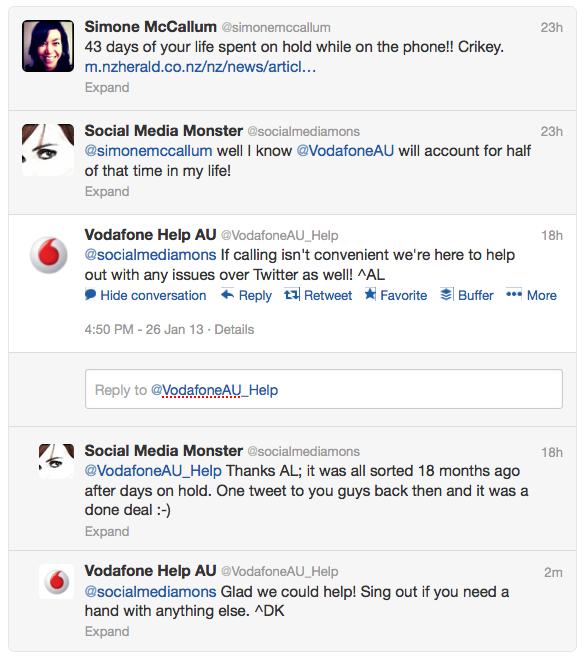 In fact what unfolded was the 101 on how not to use Social Media as a customer service platform. At which point I start getting a little ticked off.. @VodafoneAU_help are you really reading the tweet history or just shooting from the hip here? Being sent to a store is like being asked by a Doctor what he should prescribe for tonsillitis. We assume customer service staff, particularly in telco and computing retail, have some IT skills: but the truth is – unless you strike it lucky – they are just salespeople selling phones and dealing with the technologically challenged who can’t figure out how to get email, surf the net or play music on their new smartphone. You see I’ve been into their stores before with my previous iPhone, and I was less than impressed when their staff used Google to troubleshoot why the network was having issues with the device (it was because the Vodafone network wasn’t compatible with the iPhone 3GS: something they neglected to tell consumers who bought them). I can use Google too, and I’m not wasting an hour or two visiting a store who won’t be able to assist me or replace my device, or actually be any help at all. The final insult: being ignored. And then finding in mid August Pinterest suddenly appears to be working via the device. Right. Customer service: either online or in person, particularly in complaint handling, is outcome focused. 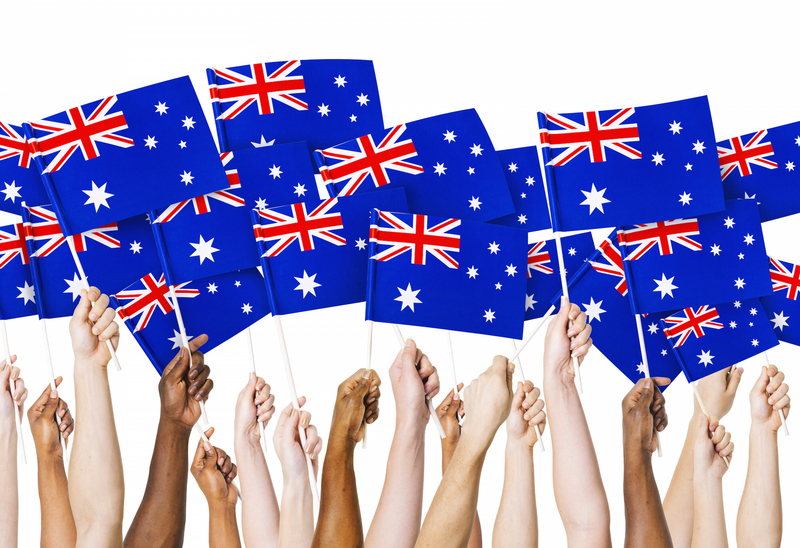 You want to keep your customer happy, and your customer want their issue resolved. 2. The ‘social media team’ don’t brush up on the conversation history. I’m sure they are dealing with hundreds of Twitter-Complaints at a time, but spending a little time reading the chatter history before launching into a repeat of the last guy is worth the effort. This is brand PR 101: Listen to your customers and understand what they are telling you. 3. The ‘social media team’ can’t bring the case to a conclusion because they don’t know what to do next. So they just ignore it. Unless your ‘social media team’ can actually help customers with their issues and they have decision making capabilities (in person and in company policy), once the initial troubleshooting is over without success don’t handball it to another (and unknown) person or store. Was I meant to print out the Twitter history and take it to a random store so a random salesperson could figure it out? 4. 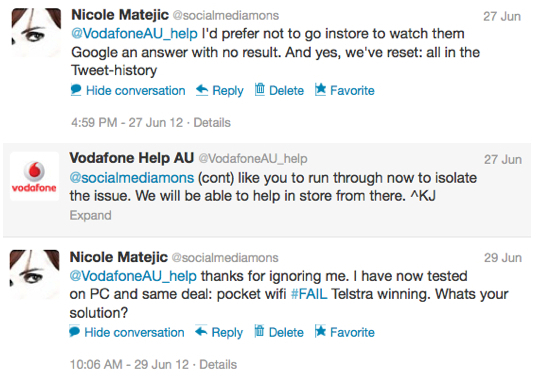 The fatal flaw in Vodafone’s approach lies in their apparent inability to make decisions to assist their customer. Troubleshooting is one thing, resolving an issue is another. A better approach would be to put me in contact with a local store, where a technically minded salesperson was available to actually (a) conduct some non-Google based diagnostics on the device and (b) was in a position to either repair, replace or refund for the device. So roll on the 29th of October 2012 when my contract expires, and I exit stage left. This time, like a relationship gone bad, there will be no going back.